The Two Palaverers was a colonial-era New England tavern and popular community meeting place. Though a couple of hundred years have passed, we wanted to establish a new community meeting place where people with a love for New England could share their experiences with our wonderful part of The United States. Calling it The Two Palaverers is a tribute to those who came before us and helped make New England what it is today. The husband and wife team of Rob and Laura Ciampa are passionate New Englanders who have spent decades exploring the highways and byways of New England in search of regional character, culture, and cuisine. Having collectively traveled millions of miles around the world, they always returned to New England, enthralled by all those things that make this region so unique, interesting and ever-changing. In 1992, Rob and Laura started the Brooks Estate Preservation Association, the precursor to the Medford-Brooks Estate Land Trust, a regional non-profit responsible for successfully saving a forty-acre, historic New England property that dated back to a 17th-century land grant in Massachusetts. Recently, they have begun establishing a strategic non-profit organization to help address the unique challenges faced by small organizations, non-profits, cities, towns and other regional entities in the northeastern United States. Rob, an award-winning marketing executive, was raised in Medford, Massachusetts and spent his early summers at Buzzards Bay on the south coast of Massachusetts. For years he worked at The European, a landmark Italian restaurant in Boston’s historic North End where he labored in the kitchen, waited on tables and managed the wine cellar. It was at The European that Rob established his interest wine, culinary history, and the importance of food as a societal bond. Inspired by the late journalist and fellow New Englander Waverly Root, Rob also spent the past twenty years exploring small regional villages in Italy and France, studying the intersections of history, culture, food, and drink. Laura, a regional market researcher, moved to Boston in the 1980s after spending numerous summers visiting New England. Growing up, she worked on a local farm and later at one of the first independent cheese shops in New Jersey. Not long after moving to Massachusetts, she joined the retail side of J. Bildner & Sons, Boston’s former, renowned luxury-food purveyor. For the past ten years, Laura has sought out, identified and connected regional people and organizations all the way from New Orleans to New England. The goal of the Two Palaverers is to recognize the people, places, and things that exemplify the character of New England. The idea for the Two Palaverers originated when Rob and Laura returned to New England after being away for several years. Living out of the area only confirmed to them that the richness, diversity and common bond of the six state region is unmatched by any other place. The inspiration for the name was the Salutation Tavern, a colonial landmark in Boston’s historic North End. 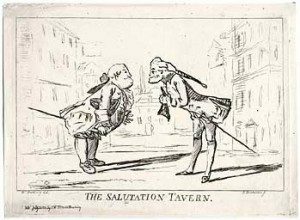 Outside the tavern was a sign with “two old gentlemen in wigs, cocked hats and knee-breeches ceremoniously saluting each other.” These men became known as “The Two Palaverers” and the tavern assumed this second name. Though we don’t often hear about the Salutation Tavern or its equally famous peer, the Green Dragon Tavern, in our study of history, their role in the birth of our nation can’t be denied; they were the planning venues for the Boston Tea Party and other events leading up to the American Revolution. Iconic figures such as Samuel Adams, Paul Revere, and John Adams frequented them. We thought it fitting to resurrect the name The Two Palaverers as a tribute to our regional and American history, an attribute for which New Englanders are ever proud. We were also inspired by the word palaver, which means to “talk idly,” another attribute for which we New Englanders are known. Please join us in palavering about New England. 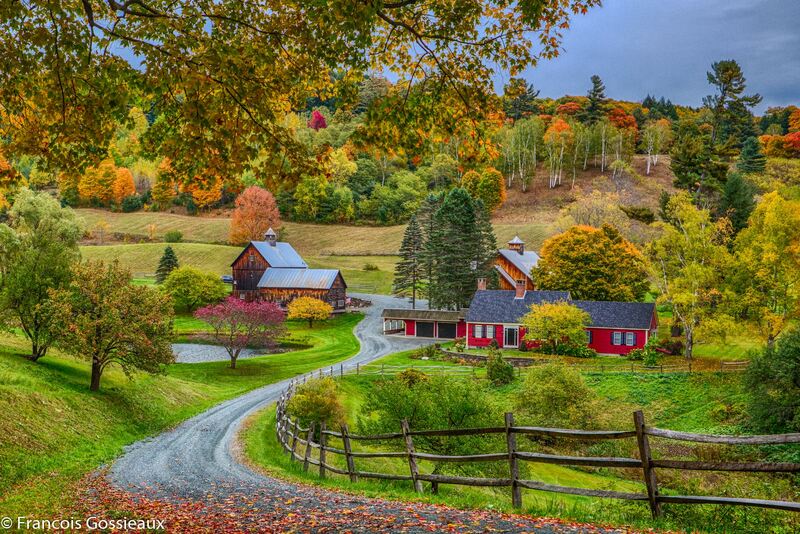 Big thanks to our friend Francois Gossieaux for allowing us to use some of his fabulous New England photography. Please see more of his work at www.localcaptures.com.